vbat.org - Tourism in oasis, Natural and cultural mirages of an encounter? Art. Cahier d’études africaines (2009). Séance photo: Jeri, le gardien du temple antique d’Amon, et deux touristes japonaises, Maliqo et Saliqo. Siwa, Aghurmi, le 18 mai 2003, 19h. From Tourism to discover the nature of North African oases to Tourism to attain now the “essential nature” of oases’ communities, this article will show that the landscape, and environmental dimensions remain a permanent feature, fueled by transnational imaginations. 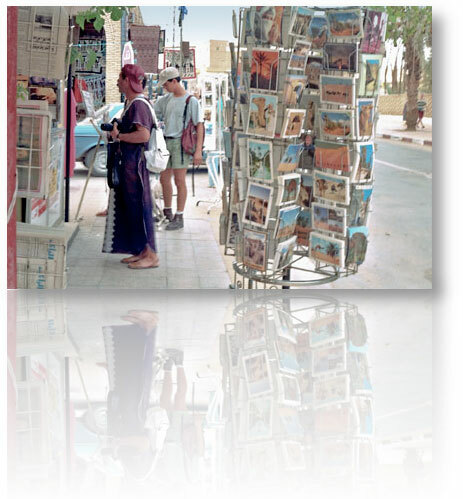 This paper focuses on two ethnographic oasien fieldworks: the Arabic-speaking region of the Jerid in Tunisia, and the Berber-speaking oasis of Siwa in Egypt. The tendency of contemporary tourism is clearly “culturally” oriented. Less an opposition between “cultural tourists” and “un-cultural tourists,” it is mainly a zeal among some to implement a new resource and a new register of tourism practices. Aesthetic emotions have also evolved (from picturesque to authenticity), with the demand for direct and true access to the local culture. More than taking in the panorama offered from inselbergs from Siwa or balloons in Tozeur, nothing can compare to a “real” marriage or a “real” party of drunken young workers under the palm trees. Misunderstandings and simulacra, however, also leave room for satisfaction. A “novlangue” (“newspeak”) is perhaps being invented, co-produced by tourists and the local interface, combining identity preservation (cultural diversity) and biological/environmental preservation (biodiversity). Un touriste déguisé en local. À ce qu’il lui semble. © Vincent Battesti. Tozeur (Tunisie), 1995. V. Battesti (2009) - Tourisme d’oasis. Les mirages naturels et culturels d’une rencontre? This article has been read 2031 times. Dernière mise à jour de cette page le Friday 26 May 2017 à 16:19:17. //// -----> Citer cette page? Vincent Battesti, "Tourism in oasis, Natural and cultural mirages of an encounter?" [en ligne], in vbat.org anthropoasis, page publiée le 23 June 2009 [visitée le 22 April 2019], disponible sur: http://vbat.org/spip.php?article469.